Disco Night AND Star Trek Discovery are back with the first of four Short Treks! “Runaway” has Cadet Tilly making a new and unexpected friend aboard the Discovery. And boy is it great being back aboard the ship. The length between seasons is killing me. Especially when “Will You Take My Hand” ended with the arrival of the Enterprise? 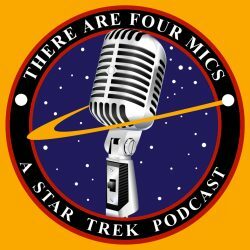 But as for this episode of Short Treks in particular? We kind of had some mixed feelings. Even so. Star Trek we’re kinda lukewarm for is better than no Star Trek. Maja Vrvilo takes control of the camera as the director of “Runaway.” And it’s also looking like its her first involvement in the Star Trek universe. But fear not! She’s coming back in season two with the episode “Perpetual Infinity.” Outside of Star Trek, she’s done a dozen episodes of Hawaii Five-0, and a couple episodes of Gotham. Alex Kurtzman is back for his first story-writing credit since “The Vulcan Hello.” And he’s teaming up with Jenny Lumet for her Star Trek debut for “Runaway.” According to IMDB she’ll be returning for two episodes in season two, so that’s good news. Her other credits include the 2008 indie-darling “Rachel Getting Married,” and also 2017’s “The Mummy.” That last one is particularly interesting! That was directed by her co-writer on this episode, Alex Kurtzman. Seems a safe assumption he’s the cause of her getting into the Star Trek universe. This is not an episode filled with characters! Of course we have Mary Wiseman reprising her role as Sylvia Tilly. But beyond that, none of the Discovery crew swings by in “Runaway.” Her co-star for this episode is Yadira Guevara-Prip, playing the escaped princess Me Hani Ika Hali Ka Po. They call her Po for short. And she’s a goddamned delight, reminding me of Sofia Boutella’s Jaylah from Star Trek Beyond. As of the time of this writing, Guevara-Prip isn’t listed as being in any more episodes, but I’m hoping the Discovery will swing by her planet at some point. Listen in as your hosts, Jason and Joe, review the happenings of each episode on our Star Trek Discovery podcast! You might wanna subscribe to Disco Night: A Star Trek Discovery Podcast in iTunes. It’ll improve life and happiness.